Is Berlin a place where the world’s most famous street artists meet? It seems like we are about to find out. The names on the “most famous street artists” list are likely to change on a yearly basis, but there are a few ultimate masters who will probably always be known either as the pioneers or the superstars of street art. How many of them have visited Berlin and left some works throughout the city? In a way, this topic is an outgrowth of another one, which we discussed a few months ago. We were wondering if Banksy has ever really been to Berlin, revisiting each of the possible options elaborately and opening some new questions accordingly. Now it’s time to go through the list of famous artists whose Berlin-based works aren’t as obscured and unclear as Banksy’s. Telling the East Gallery art story is hardly imaginable without mentioning the name of Thierry Noir. It is unclear if the French artist became so famous because of his idea to paint on Berlin Wall, or if the wall became a “gallery” because of Thierry. Either way, the artist was the first one to leave trace on the surface of the infamous monument (which became a monument years after Thierry started painting on it). 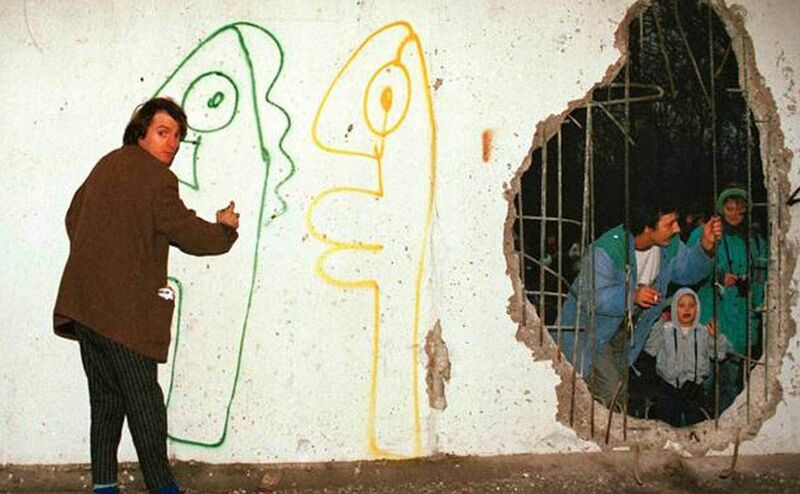 The first drawings were made in April 1984, and from that moment on, artists were increasingly attracted by the idea to express themselves on the wall. Noir’s original murals cannot be seen in person anymore, but you can see his work documented in Wim Wenders’ film Wings of Desire. What Thierry Noir is to the Berlin Wall, Blu is to Kreuzberg. A few of his momentous murals, the photos of which you would probably put right next to his name, were made in Berlin’s Kreuzberg area. We’re talking about three large-scale murals, each of which represents people depicted in his recognizable manner and style, pointing to the most common issues related to the modern age social phenomena. 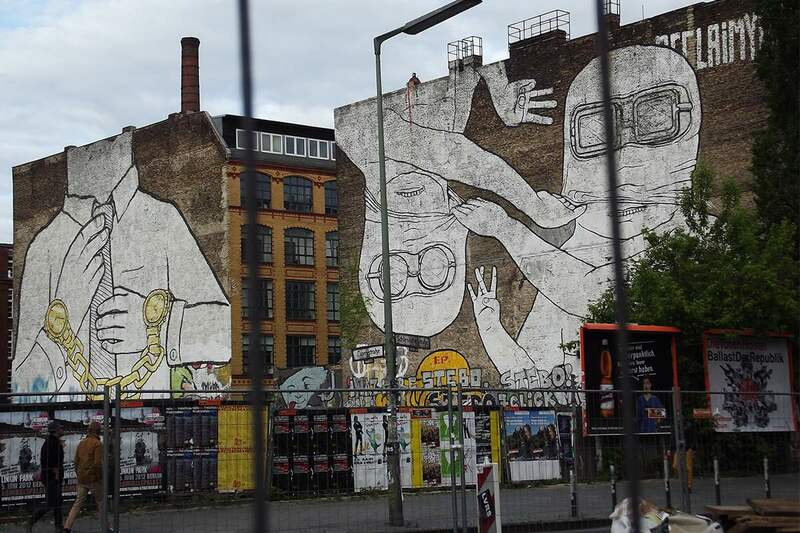 However, these murals were painted over recently, since the co-creators of Kreuzberg murals decided it was time for them to vanish, along with the era that they used to represent, which is more or less how Lutz Henke explained it for the Guardian. Thanks to the photographs, both the murals and their spirit are kept alive in a way, and this is partly thanks to JR, who took some of the most famous photographs of these artworks. Speaking of JR, the famous French street artist and photographer, his own contribution to Berlin’s streets is also a significant one. 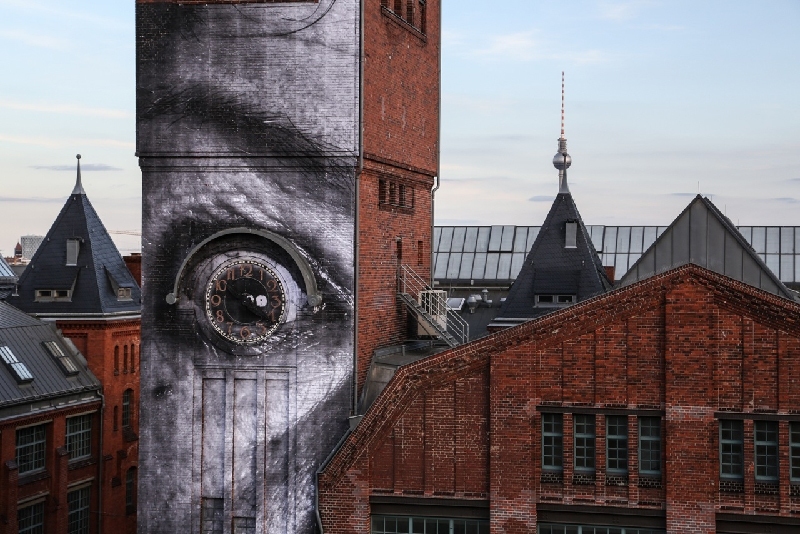 As part of his project Wrinkles of the City, JR visited several cities and the German capital was one of them – beside Los Angeles, Istanbul, Shanghai, La Havana and Cartagena. In April 2013, JR covered the walls of 15 buildings located in Berlin, depicting beautifully portrayed people, mostly the elderly whose presence suddenly became visible and larger than life. The architecture of the city responded to the black and white aesthetics, supporting the genuine sentiment of the artist. 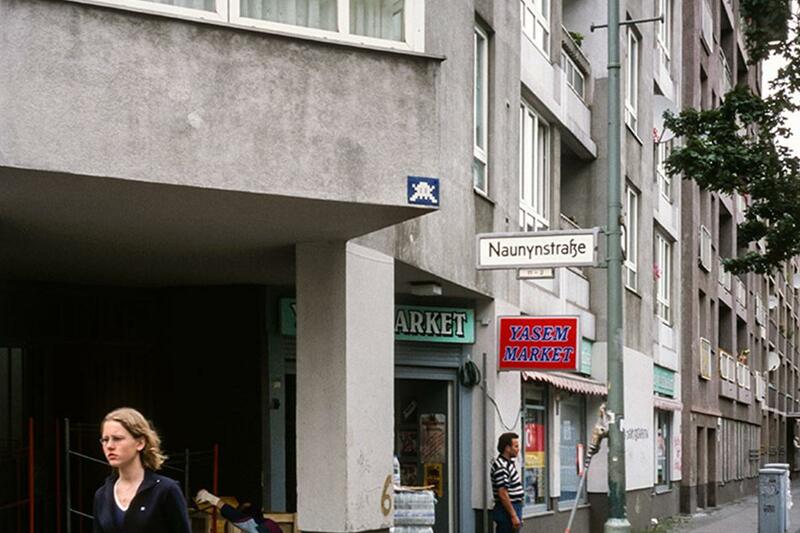 Space Invader is on a mission to conquer the world, and according to his website Berlin was invaded by 11 little incarnations of the original invader. You may notice his iconic mosaics at 58 Auguststrasse, somewhere in Naunynstrasse, and near the Alexanderplatz S-Bahn station as well. As for the other 8, it looks like you’ll have to do the search yourself, which might be an exciting experience, given that you’ll come across a vast number of other street artists’ works and remarkable graffiti art. 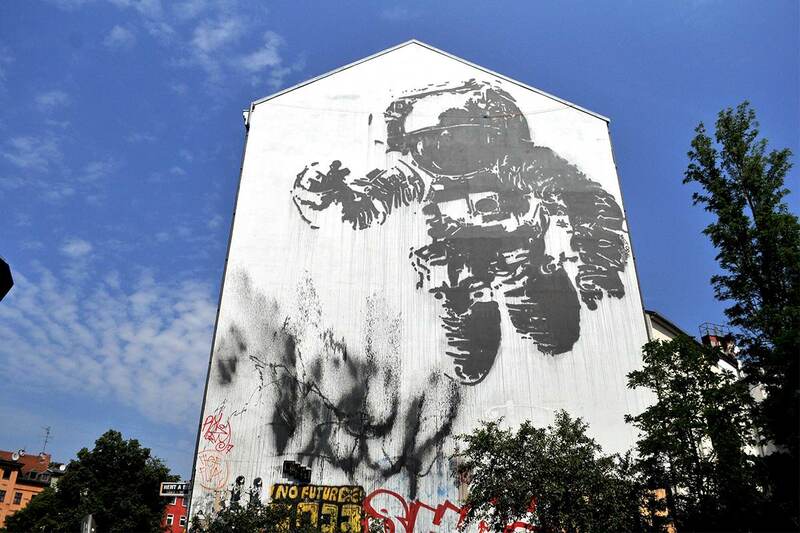 Victor Ash’s stencil depicts an astronaut, but a very, very big one. The size of this gigantic piece is 22 by 14 meters, and it remains one of the biggest stencils ever made to this day. The Paris-born artist describes the subject as a reference to the Cold War and the ever famous battle between the USSR and the United States. The Xberg Astronaut was created as part of the 2007 Backjumps festival, and it is an important piece both for Victor Ash and for Berlin, since it became one of its landmarks. But this is not the only piece made by Ash in Berlin. Make sure to check out the May the roof over your head be always strong, a piece that consists of 6 wall paintings that embellish the entrance of Bethanien Museum. Brought By Urban Nation – Shepard Fairey, Nick Walker, etc. You may or may not like the non-spontaneous way in which Urban Nation refers to street art, but the truth is that they did manage to reach through to some of the most outstanding names in the game. 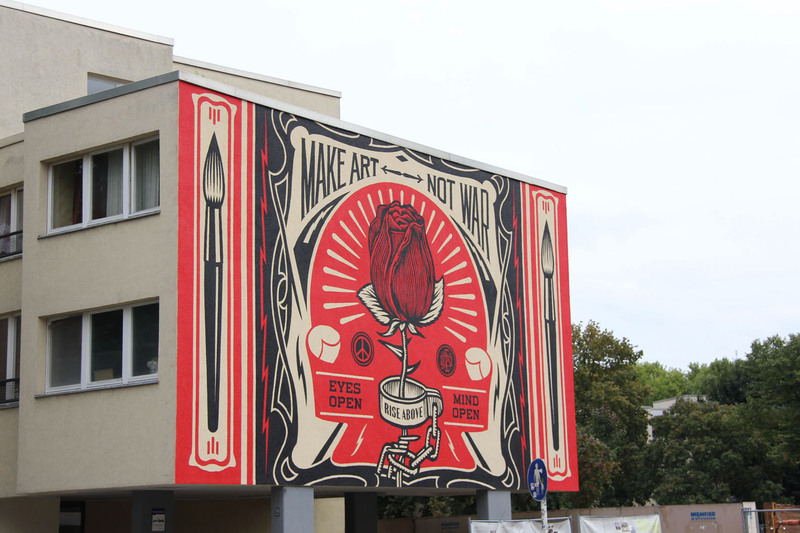 Although it was neither his first, nor the last time in Berlin, the large Make Love Not War public piece was made by Shepard Fairey thanks to Urban Nation’s devotion and engagement, and it was quite popular at the time of its creation (in 2014). Urban Nation was also the one responsible for bringing Nick Walker to Berlin recently, for a piece made in 2014 in collaboration with SheOne, for their Project M/5. Well that settles it – it seems more than obvious that Berlin is capable of bringing together some of the key figures in graffiti and urban art culture. 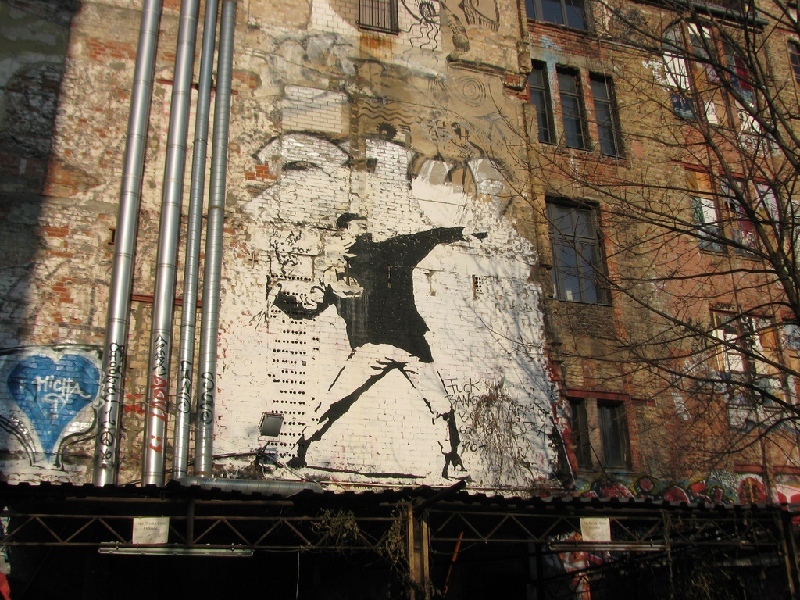 If you’re looking for more, you should check out our ultimate guide to street art in Berlin, a comprehensive survey of Berlin’s most famous wall art. Also, keep in mind that public art was not only reserved for street artists as we know them today. 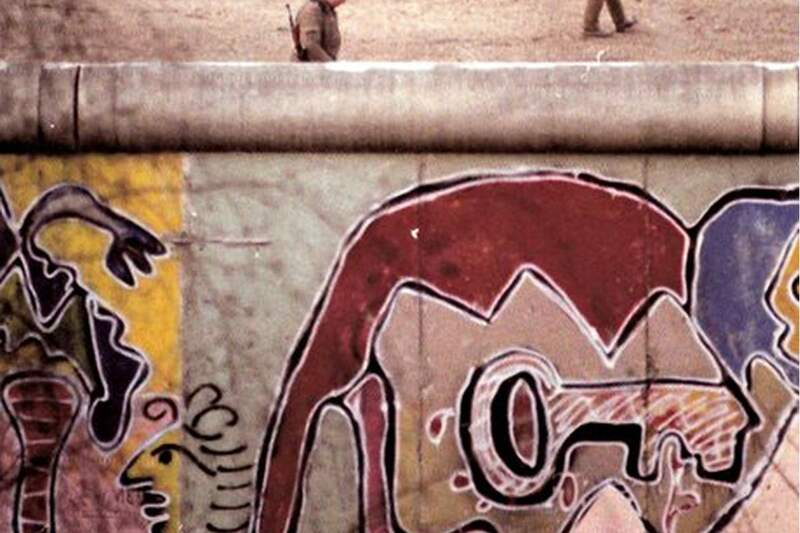 The Berlin Wall welcomed some artists who were not strictly related to muralism, but worked in fields alike, such as Keith Haring, for example. Berlin was fortunate enough to attract some of the greatest illustrators, artists and thinkers, and even if most of their work no longer exists, the energy is still immersed in Berlin’s spirit today.